This recipe has been a long time in the making. 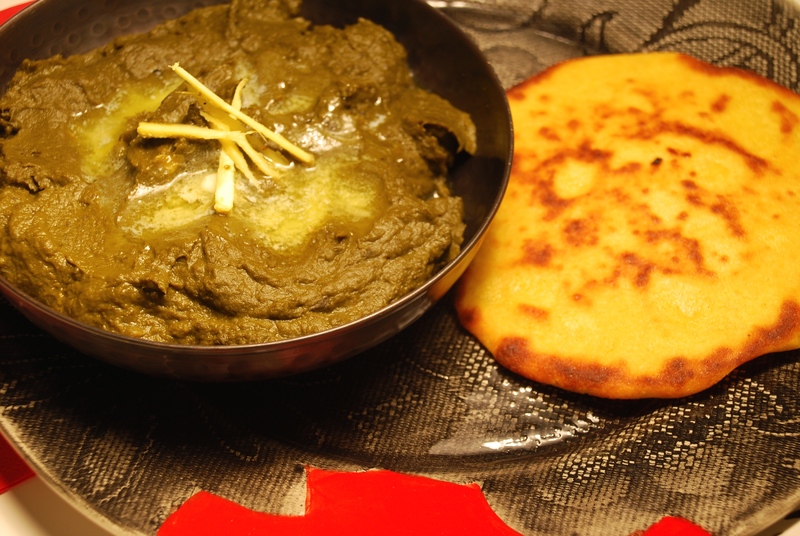 I love saag and makki ki roti (bread made of sweet corn flour) to no end. Only my mom’s or my grandmothers would do. I just never thought I would ever cook it myself. It was one those larger than life recipes which I imagined only they could take on and get right. This is the pure Punjabi saag the way it is made in proper punjabi homes to this day. How can I explain the flavor to someone who has never smelt this glorious dish slowly and lovingly cooked and put together by their “nani” (maternal grandma) or their mother when they come home from school. Hmm…It’s closest approximation for people non familiar with it would be to compare it to palak paneer. But oh my god, this saag made of mustard leaves is just so much more. It is sharper in flavor and a bit earthy. It is simply gorgeous and if you are lucky enough to have a Punjabi friend who knows how to cook this, pester them till no end so they let you taste this king of Punjabi dishes which will make any Punjabi worth their salt nostalgic to no end. 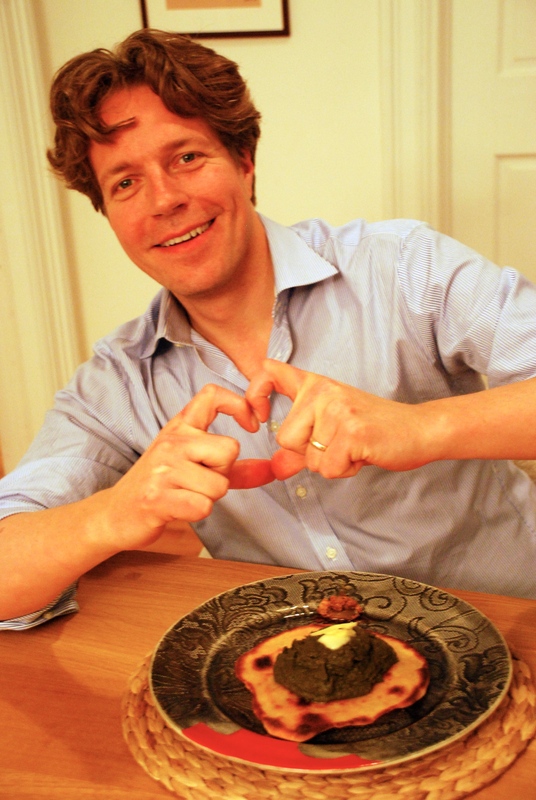 Even my English husband has fallen for the charms of this gorgeous dish, he had it the first time when my mum made it for us just before we got married! I really didn’t think I was ever going to be able to make this amazing dish, but thanks to my hero Tony Bourdain, I actually attempted it. I saw him in his “Punjab” episode of Parts Unknown, going and eating his way through Amritsar. There I was already drooling when he was eating Daal Amritsari and Bangan ka Bharta ( which also I had never made before but made the next day after watching the show). I saw him eat this beautiful saag and makki ki roti with this beautiful white butter on top and I could not think of anything else. I used to eat this as a kid, it was perfect on winter evenings in Delhi or Sydney. I got all those memories of my grandma and my mom cooking this divine dish and could remember how it smelt too. Seeing him with a beautiful plate of it on the show was all getting too much. It has to be said that I think my husband is at times a tad little bit jealous of my love of Tony Bourdain! Always trying to make me watch something else when its Tony time and muttering things under his breath on Tony’s awesomely cool commentary! lol! Anyway, I went nuts looking at him eating the saag on my living room TV and ordered mustard leaves from fresh direct (I searched for them on a whim the next morning), I could not believe my luck that they actually sell the stuff! Surely this was the second sign that I must learn how to make saag! So I got on the phone to my mom and asked her how she does it. 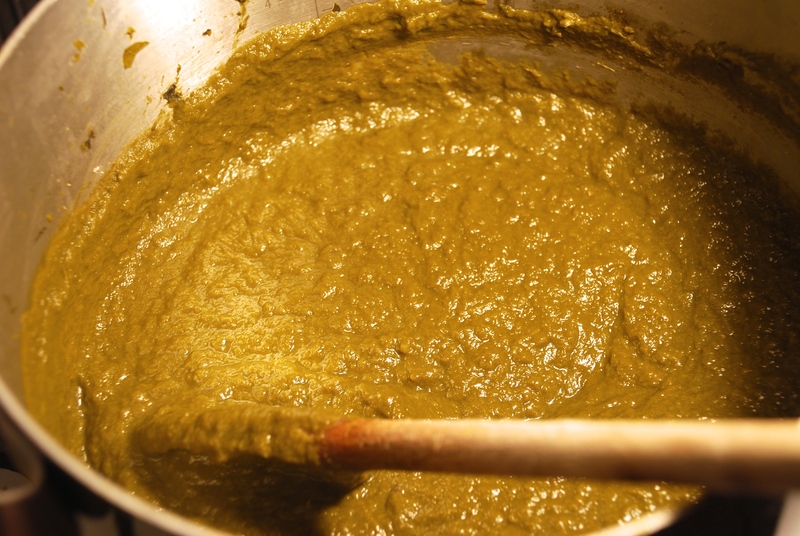 The saag is made of 1 kg mustard leaves to 400 grams fresh spinach. That was the proportion I used anyway. Saag has to be accompanied with makki ki roti. Otherwise it is just not right in my book. The sweetness from the corn is just perfect paired with the sharp mustard flavors. If you positively can’t get sweet corn flour then eat with another type of roti like a chapati. I also looked at the recipe from the trusted authority on Indian food… “Prasad cooking with the Indian Masters”. My moms recipe and his were pretty similar. I just could not handle the quantity of butter they suggested in the book so halved it. The taste really did not suffer because I used half the butter. This saag beat all my expectations and I was mighty impressed with the results. It was like my mum had come over from Sydney and cooked it. Don’t you just love it when things work out! So thanks Tony for inspiring me to attempt this very properly punjabi dish and making my grandmother smile down on me for keeping up traditions! 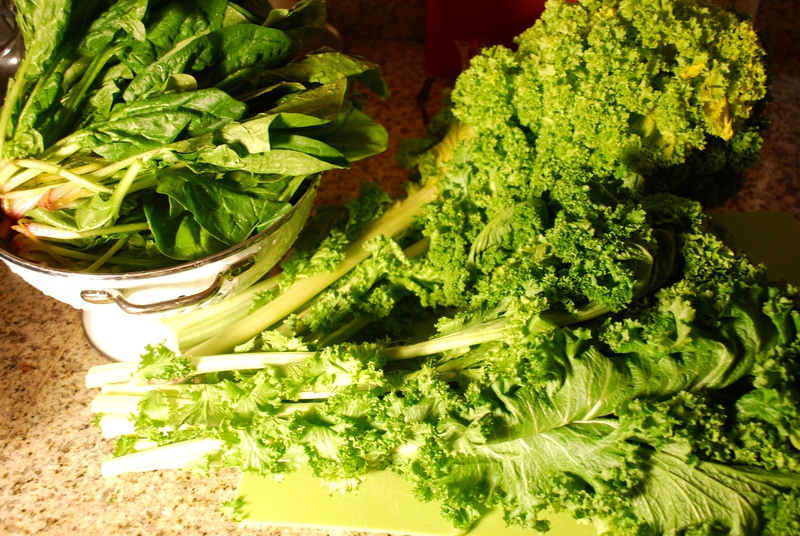 Wash, drain and cut your greens into strips so they are more manageable. 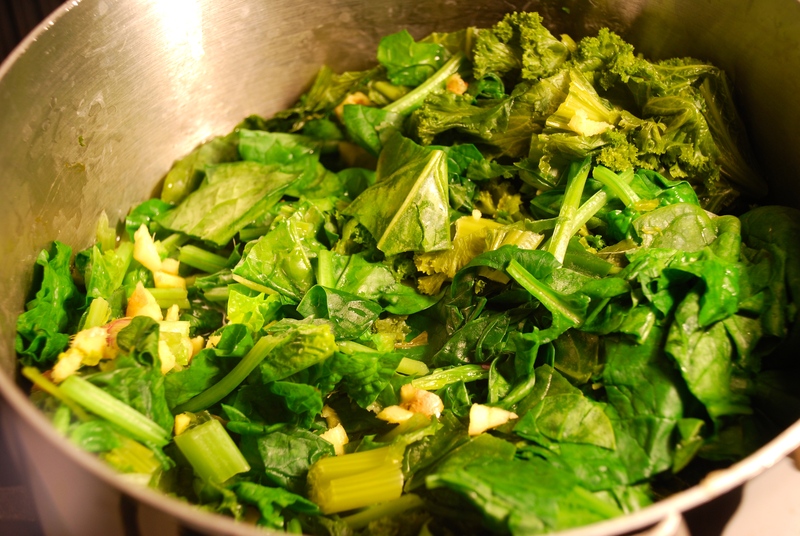 Place your mustard greens in the pot add six cups of water and turn the stove on, cover the pot. You will not be able to fit all of them at once, so when they shrink down a bit add more greens, repeat this till all the greens fit. Add four green chilies and half the roughly chopped ginger to the pot too and simmer for two hours once it has all come to a boil. Transfer cooked greens to a blender and blend but don’t make it too fine and smooth, you want a slight bit of texture to it. Put back into your pot and add half the butter. Cook for half an hour simmering and stirring every few minutes. Place a cover on the pot keep it slightly open to let steam escape from the side. This will prevent your saag from splattering all your walls and you as you will see it really spurts around all over the place if you cook it. I even stored it with the lid still covering most of the pot to avoid the hot stuff landing on me. 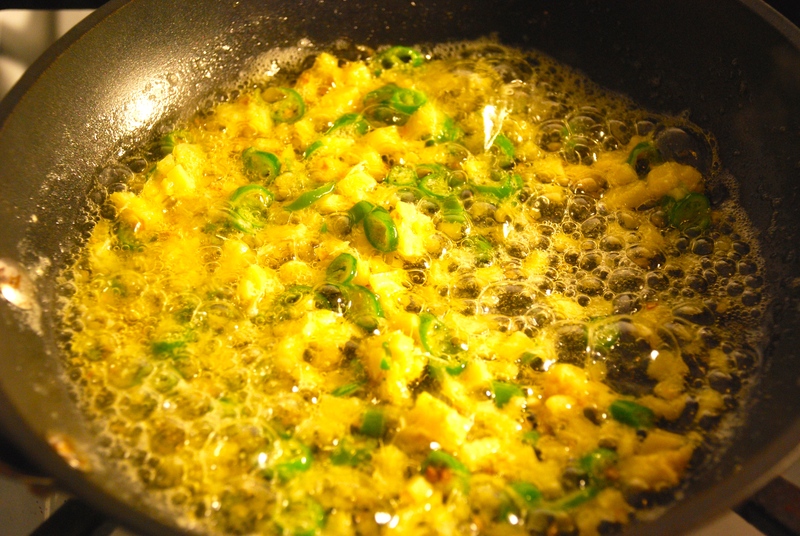 Now heat the remaining butter and throw the other half of the ginger and the chopped green chillies. 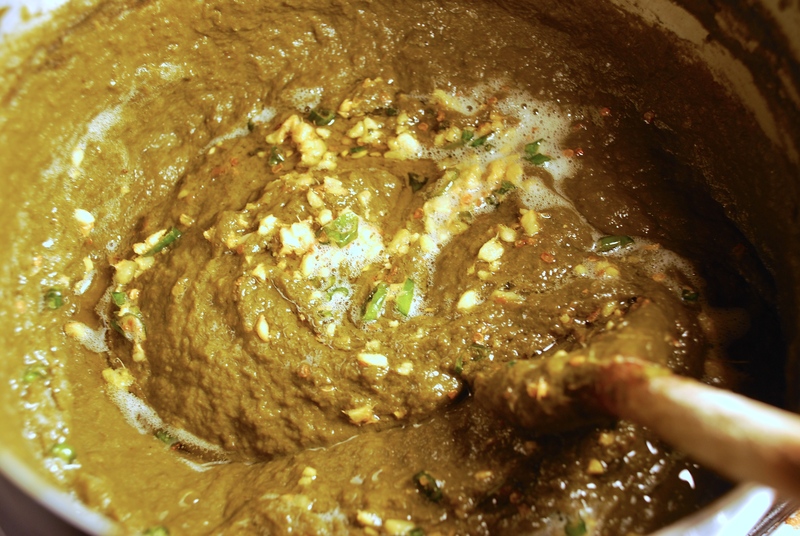 Cook for 2-3 minutes and then tip this tempering mixture into the saag. Mix really well and let it cook for 5-7 more minutes so the flavors combine well. Your saag is now ready. Eat it with some yummy makki ki roti if you want a mouthful of perfection, otherwise have it with a chapati. To make it really complete you must serve with some mango pickle and mooli or radish….perfection!